Geothermal heating experts from Sinton AC and Heating Inc.
Is Geothermal Heating Right for You? 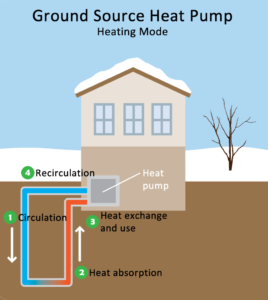 Have you considered a geothermal heating installation for your home? Are you wondering if it is right for you and your family? Geothermal heating can have many advantages over traditional HVAC systems. Determining your heating goals for your home will help you to decide if, geothermal is the best system for you and your family. Do you want to avoid having a system that must be maintained on a regular basis? Conventional heating and cooling systems require regular maintenance to ensure they are running at peak performance at all times. Filter replacement, duct cleaning, refrigerant refill are just some of the maintenance requirements that should be performed on a traditional HVAC system. Today we have more systems than ever to keep up with. From cars to computers to cell phones to household appliances, the list of items we must maintain keeps growing. You may find you are like other people who are looking to reduce the number of systems they have to keep track of. A properly buried geothermal loop will last for generations. The remainder of the system is housed indoors and not subjected to harsh elements. Typically your geothermal system will only require filter changes and intermittent check-ups. If you are one of the many homeowners who would prefer to reduce the maintenance of yet another system in the home then a geo-thermal heating and cooling system will help remove one more task from your to-do list. Are you environmentally conscious and want to reduce your carbon footprint? As the population on our planet continues to grow and expand, we continue to look for strategies we can employ to reduce our impact on the planet. If more people could reduce their carbon footprint on our planet, we could have a positive impact on our environment. The geothermal system uses energy from the sun and stores it in the earth. It then transfers heat to your home. Since geo thermal doesn’t burn fuel and only uses a minimal amount of electricity to run the unit, it reduces air pollution and the greenhouse effect. If you want an environmentally friendly system that will make the best use of Mother Nature while not having a negative effect on the environment, then the geo-thermal system will be the best choice for your goals. Do you want a system that is more efficient than your current system? Are you looking to get them most out of your home’s heating and cooling system and want it to run as efficiently as possible? Geothermal systems run three to four times more efficient than a conventional system. Geo thermal systems provide three to four units of energy for every one unit used since they don’t burn combustible fuel to create heat. Are you trying to avoid yearly weatherization tasks? Preparing your home for the winter season can be a time-consuming task that many homeowners dread. Geo-thermal systems are great for reducing your energy costs even if your home doesn’t contain top-of-the-line insulation. With that in mind, you will obtain even greater savings if you do take the time to weatherize and properly insulate your home. As you can tell, geothermal heating cooling have a lot of great benefits over a conventional heating and cooling system. You may be wondering what the down-side could be to a geo thermal system. There are a couple issues you need to be aware of before taking on a geo-thermal system. Every locality has their own ordinances, codes and licensing requirements. Since there are so many localities in the country, we cannot possibly keep up with every one of them. Some geothermal installations will be subject to various codes, licensing or ordinances. In some instances, only part of the installation may be affected by your local ordinances. We advise you to check with your locality to obtain the procedures and requirements for installing a geo thermal system in your area. The quality of your water can have a huge impact on your geothermal system. Your water should be tested for hardness, acidity and iron content before a heat pump is installed. Minerals and impurities such as iron can have a detrimental effect on geo thermal systems and quickly clog them up. It is vital to have your water tested prior to considering a geo-thermal installation. Geothermal systems should never be powered from water from a spring, pond or river where there may be excessive particles that may clog the system. If you have a high quality source of water and have checked the ordinances in your area, your home will be perfect for a geo thermal heating installation. The energy savings, reduced maintenance and efficiency of a geothermal system will help you keep more money in your pocket, spend more time with your family, have less maintenance costs and head-aches…and most importantly keep your home and family comfortable for generations to come! While there are many times you can get away with a simple repair, it is always in your family’s best interest to have your HVAC unit inspected and maintained by a professional.